Let's Clap, Jump, Sing & Shout; Dance, Spin & Turn It Out! : Games, Songs, and Stories from an African American Childhood est le grand livre que vous voulez. Ce beau livre est créé par Patricia C. McKissack. En fait, le livre a 184 pages. 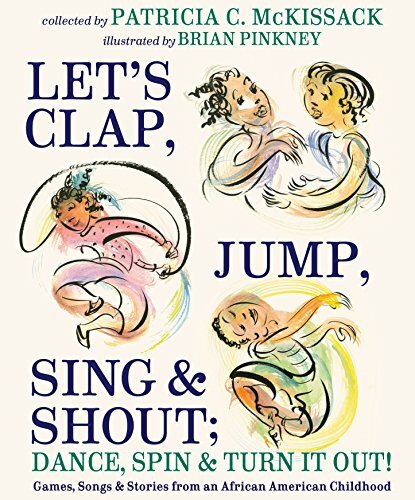 The Let's Clap, Jump, Sing & Shout; Dance, Spin & Turn It Out! : Games, Songs, and Stories from an African American Childhood est libéré par la fabrication de Schwartz & Wade. Vous pouvez consulter en ligne avec Let's Clap, Jump, Sing & Shout; Dance, Spin & Turn It Out! : Games, Songs, and Stories from an African American Childhood étape facile. Toutefois, si vous désirez garder pour ordinateur portable, vous pouvez Let's Clap, Jump, Sing & Shout; Dance, Spin & Turn It Out! : Games, Songs, and Stories from an African American Childhood sauver maintenant. From Newbery Honor winner Patricia C. McKissack and two-time Caldecott Honor winner Brian Pinkney comes an extraordinary must-have collection of classic playtime favorites. This very special book is sure to become a treasured keepsake for African American families and will inspire joy in all who read it. Parents and grandparents will delight in sharing this exuberant book with the children in their lives. Here is a songbook, a storybook, a poetry collection, and much more, all rolled into one. Find a partner for hand claps such as “Eenie, Meenie, Sassafreeny,” or form a circle for games like “Little Sally Walker.” Gather as a family to sing well-loved songs like “Amazing Grace” and “Oh, Freedom,” or to read aloud the poetry of such African American luminaries as Langston Hughes, James Weldon Johnson, and Paul Laurence Dunbar. And snuggle down to enjoy classic stories retold by the author, including Aesop’s fables and tales featuring Br’er Rabbit and Anansi the Spider.